June launches Toronto's high travel season, so you should make reservations for hotels, theaters, tours, and restaurants, ideally at least a couple of weeks in advance. A lot of the city's most vibrant and interesting festivals take place during June, and lively streets keep dull moments in short supply as summer arrives in the lakeside city. Residents and visitors alike take advantage of the outdoor patios, open-roofed tour buses, bike rentals, lake swimming, and Toronto's best outdoor attractions, such as Canada's Wonderland, as June's warm weather fully takes hold. A handful of rainy days may mar June's otherwise sunny record when temperatures typically hover in the high 60s F, low 70s. The city's location on Lake Ontario, however, means the weather can be unpredictable, so it's best to be prepared for all circumstances. Visitors can expect rain about six days out of the 30 in June. Though temperatures definitely start to warm up in June, potentially cool evenings mean you want to bring a light jacket, fleece, or shawl for warmth. Shorts and T-shirts work for informal daytime activities, while long-sleeve shirts and long pants still make sense at night or when you need to dress a little more formally. Bring an umbrella, bug spray if you plan to head outside of the city, and a sunhat and sunscreen. Warmer weather means visitors can enjoy more of Toronto's great outdoor offerings, such as sitting on patios or going on a walking tour of the city. Some of Toronto's big summer festivals get underway, such as Pride Toronto and Luminato. Summer road construction can slow down travelers. Travel rates start to increase, and during Pride Week, hotels tend to sell out. 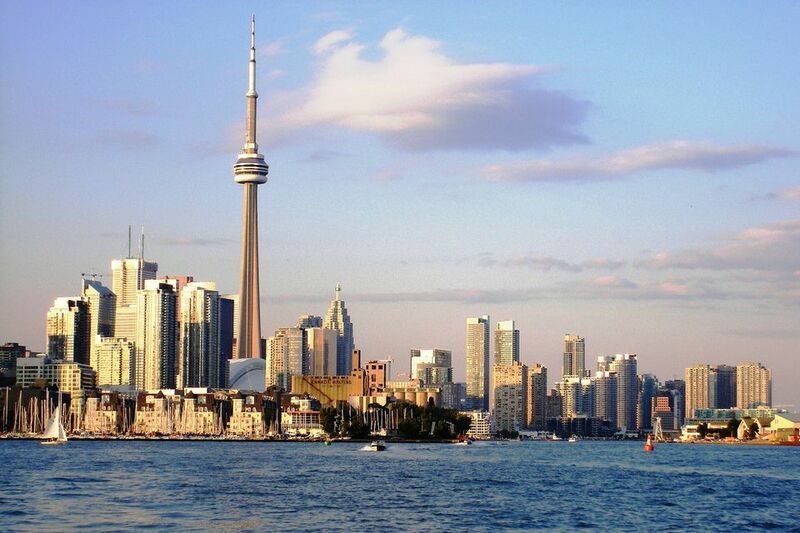 Toronto has a wide range of hotels from luxurious to budget and everything in between. Most major chains operate properties in Toronto, with many from the higher-end brands clustered in the upscale neighborhood of Yorkville and downtown around the financial district. Surprisingly, you can find many mid-range and budget options along the waterfront. Book a stay in an unoccupied student residence to really save money. You can often rent a dorm-style room in a central location for less than $100 per night. See TripAdvisor for rates and reviews of all Toronto hotels. Pride Toronto, a nine-day celebration in June, hosts one of the world's biggest gay pride rallies; expect crowds. Toronto's location on the shore of Lake Ontario means you can find beaches in the city and June usually offers the year's first opportunity to take a dip without freezing. Canada's Wonderland, the country's biggest amusement park located about 25 minutes outside of the downtown core, opens for business this month, but with school not yet out for the summer, you can have the place mostly to yourself, especially on weekdays. In this ethnically diverse city, you can find back-to-back festivals all year long ranging in size from impromptu gatherings of a few hundred people to city-wide extravaganzas. The city's official tourism organization keeps the most up-to-date calendar of events. Pride Toronto: For nine days, the city hosts a variety of cultural events that celebrate, empower, and support lesbian, gay, bisexual, transsexual, transgender, intersex, and queer people. Luminato, introduced in 2007, is a week-long cultural festival that celebrates music, film, art, literature, and creativity. Canadian Film Centre's Worldwide Short Film Festival highlights the best Canadian and International short films with special screenings, retrospectives, and galas. Toronto Taste offers an evening of fine food and drinks at the Japanese Canadian Cultural Centre. North by Northeast Music & Film Festival showcases new and emerging musical talent and independent movies. Distillery District Blues Festival is a free event in Toronto's historic Distillery District. The TD Canada Trust Toronto Downtown Jazz Festival showcases Canadian and international musicians performing music from traditional jazz to fusion and blues to bebop.